WOW – (from one of my absolute favorite parenting websites – Parents.Com) check out these amazing repurposing ideas for cardboard boxes, disposable plates, straws etc. I personally will try to do the doll bed and castle! 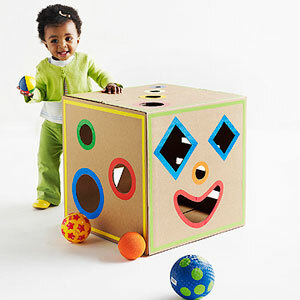 Put together this smart cardboard shape sorter to help your toddler learn shapes and sizes. Make it: While box is flat, draw desired shapes on all six sides using a compass and/or ruler and pencil. Slide cutting mat behind shapes and cut out using an X-Acto knife. Trace each cutout circle onto contact paper, then use a compass to draw a circle around it that is 1 inch larger in diameter. Cut out the ring and adhere it to the corresponding circle cutout on the cardboard box. Repeat for other circles. To outline squares, use strips of colored masking tape. Use hot-glue gun to seal the box shut on both ends. Give your child play balls and toys to put through the holes. A crafted cardboard bed will give your child’s fave doll some serious slumber. Plus, it’s so E-Zzz to make. Make it: While box is flat, cut off the four top flaps. Fold a piece of paper in half so it measures 8 1/2×5 1/2 inches. Hold folded paper vertically and cut a decorative design across the top portion. Unfold, tape to one of the short side panels of the box, and trace design. Use X-Acto knife and cutting mat to create headboard design in cardboard. Repeat to create footboard design on opposite side panel. Assemble the bottom of box and secure shut with hot-glue gun. Embellish the bedposts with pom-poms and the frame with sequins; secure with glue. 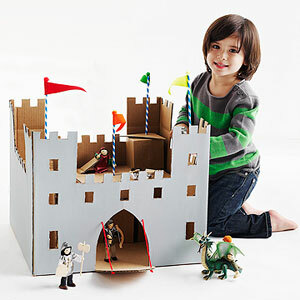 Cut notches along the top of an extra-large box to make a cardboard castle. Add tiny knights and toy horses for hours of play. The only thing missing from this fantastic fortress is a moat. Make it: While box is flat, cut off the four top flaps. To cut towers at corners, draw a 6×11-inch rectangle centered at the top of each side and cut out using an X-Acto knife and cutting mat. Create a crenellated edge by making 1×1-inch notches around the top edge of the box with an X-Acto knife and cutting mat. Draw a 7-inch-tall drawbridge door, as shown, and cut so the bottom is still attached to the box. Use a pencil to poke two sets of corresponding holes on either side of the door and frame. Cut out 1-inch squares for windows where desired using an x-Acto knife and cutting mat. Assemble box and hot-glue bottom closed. Paint outside of box with two coats of gray paint and let dry. Place assembled, smaller boxes inside castle to create height and hallways for figures. Cut two 6-inch lengths of string and thread through corresponding holes on door and frame; knot to secure. To make flags, insert a chenille stem into a straw and glue a pom-pom to one end. Cut a triangular flag shape from felt and glue short side underneath pom-pom. Attach flags to the box by pushing the chenille stems through the cardboard and bending. 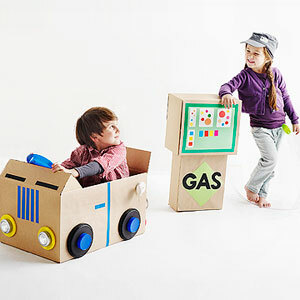 A fun cardboard car and gas pump combo will drive your kids wild! Kids will think it’s wheely awesome when they find a real key in the ignition of this cardboard car. Make it: Position assembled box so that flaps are on top and bottom. Hot-glue bottom of box shut and glue the two longer top flaps down inside the box. Cut the remaining two flaps so the rear is 3 1/2 inches long and the front is 7 inches long. Bend the front flap in half at a right angle to create a triangular dashboard. Cut two 3 1/2-inch triangles from scrap cardboard and glue to each end of dashboard; secure with hot-glue gun. Adhere two horizontal strips of black electrical tape to front of dashboard for windshield wipers, and use strips of blue painter’s tape to create a grille, car doors, and door handles, as shown. Mount each self-adhesive utility light to a yellow plastic jar lid and hot-glue to the front of car for headlights. Hot-glue two red plastic jar lids to back of car for taillights, and glue a large red pom-pom inside each. Glue a metal cupcake liner above each red taillight. Use marker to draw a license plate on colored paper and attach between taillights using yellow tape. Hot-glue the remaining red plastic jar lid to the center of a blue dinner plate and glue onto dashboard for a steering wheel. Push key into cardboard to the right of steering wheel. Glue a blue plastic jar lid to the center of a black plastic coffee can lid; repeat to make four wheels, and hot-glue each in place. Hot-glue a ketchup cap to the back left side of car for a gas tank. Have your tot personalize his cardboard car by helping him create a fun license plate. 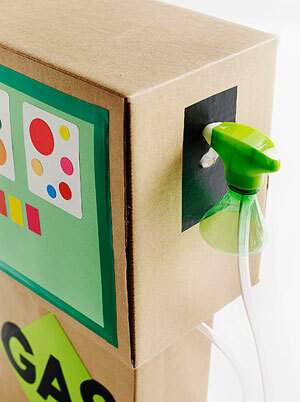 The best part about this cute cardboard gas pump? Every fill-up is free! Make it: Assemble both boxes and hot-glue flaps shut. Position the smaller box vertically on the floor and place the larger box on top horizontally; secure in place with hot-glue gun. Cut a 6-inch square of green paper and adhere to front of bottom box, as shown, with double-stick tape. Cut the letters G, A, and S and a 3×5-inch rectangle from black contact paper. Place the letters over the green square on front and stick the rectangle on the right side panel of the top box. Use an X-Acto knife to cut a 1-inch square in the right side panel of the top box and a 1-inch hole in the top of the right side panel of the bottom box. Hot-glue one end of the clear plastic tubing to the bottom of the spray bottle and insert handle into the 1-inch square on top box to hang. Insert the opposite end of tube into the 1-inch hole in the bottom box; secure with hot-glue gun. Attach a piece of green paper to the front of the top box and secure with green masking tape. Embellish paper with assorted stickers and labels as shown. 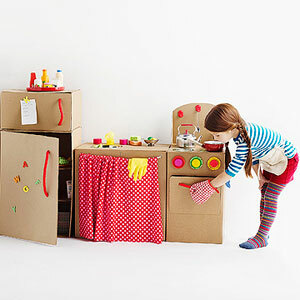 Your mini chefs are bound to cook up some fun in this pint-size cardboard kitchen. 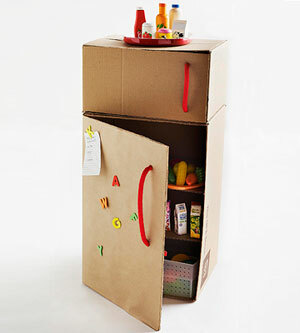 Stock this fab cardboard refrigerator with faux food for hours of pretend play. Make it: Assemble both boxes and place the smaller box on top of the larger box so the top of the larger box is the same length and width as the bottom of the smaller box; secure together with hot-glue gun. Use an X-Acto knife to cut the top, bottom, and right edges of the front panel of each box to create fridge and freezer doors. Cut two holes, about 6 inches apart, in the freezer door and two holes, about 9 inches apart, in the fridge door. Thread a length of rope through each set of holes to make handles and knot in back to secure. You may not be able to get your child to put his dishes in the real sink, but we promise he’ll spend plenty of time at this cardboard one. Make it: Position flat box so flaps are in front and back. On a short side panel of the box (this will be the top), turn the bowl upside down on the left side and trace rim. Cut out the circle, about 1/4 inch inside the traced line, using an X-Acto knife and cutting mat. Cut a 1-inch hole in the top right and top left corners of the front of the sink; thread a length of rope through, and knot each end behind to secure. Assemble box and close flaps with hot-glue gun. Rest the bowl inside the round cutout on top of the sink. Behind the bowl, place an upside-down Play-Doh container between two plastic bottle caps and secure all with hot-glue gun. Attach an empty bubble container to the Play-Doh container with hot-glue to create a faucet. Hang fabric panels or pillowcases from rope to create a curtain. 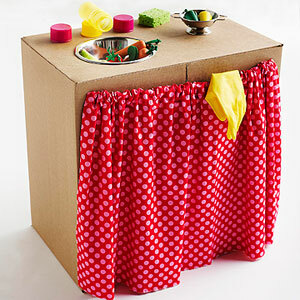 This cardboard stove will be a hot hit with your tot chef. Make it: Position flat box so flaps will be at right and left sides. Use an X-Acto knife and cutting mat to cut an oven door, as shown. Cut two 1-inch holes, about 6 inches apart, on oven door for handle; thread a thick rope through and knot in back to secure. Push a brad through the center of each plastic Play-Doh lid and use to secure to the front of the stove for controls above the oven door. Hot-glue a plastic cap over each brad. Assemble box and hot-glue flaps shut. Glue the four CDs to the top of the box for burners. Bend the right and left 4 inches of the 20×12-inch cardboard piece at right angles to create a backsplash about 12×12 inches. Trim bent side sections into triangular shapes, keeping the full width at the base. Round off the top of the middle section with scissors and hot-glue to back of stove, as shown. Adhere plastic kitchen hooks to backsplash to hold play utensils. 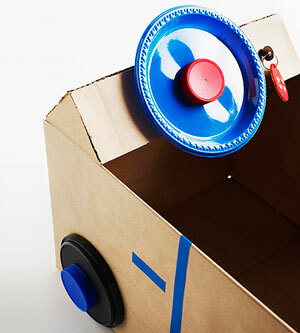 This is an awesome list of ways to repurpose cardboard boxes! I love it! I featured it on my friday favorites! Thanks a lot for sharing these great ideas! I’m looking forward to making some of them with my son. In the meantime I hope you don’t mind if I link your interesting post on my blog. Thank you for the comment and my pleasure to be linked to your blog! HAve a great year! awesome! cant wait to make some of these for my kids! Thanks for your kind comment! Happy crafting! Nice idea. I like the castle and the candle most…!! Boxes are kids favorite toys! I love this! Those are such great ideas. I loved making things out of cardboard when I was a kid, but I was never that advanced. 🙂 I’ll have to try these with the kids. Thanks for sharing! Cari! Thanks for the comment – hope you have some fun making some of these 🙂 If you want to submit a guest blog post on some of your repurposed crafting, let me know! First of all, thanks so much for signing up to follow my blog…I’m honored…and have returned the favor. Secondly, this post is AMAZING!!!! I’m all about using household “stuff” to make crafts with kids…always trying to relate it to a picture book we’ve read. Thanks, Vivian. Appreciate your kind words. These are some very neat crafts! Wow, superb blog layout! How long have you been blogging for? you made blogging look easy. The overall look of your website is excellent, as well as the content!. 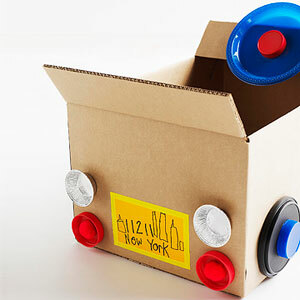 Thanks For Your article about Repurpose Cardboard Boxes into Kid Crafts/Toys! CraigslistDad . gostei muito pena que ñ tenho caixas de papelão em casa ah e quem estiver interessado ponha agora http://www.sitedatata.webnode.com.br e divirta-se! Reblogged this on Busy Mom of Three. Saving this for our granddaughter – can’t wait! Thanks for sharing these great ideas! I’m looking forward to making some of them with my sons. I hope you don’t mind I shared one of your pinterest photos on our facebook page and linked it back to this article :). Thanks for the feedback! So glad you like these ideas & want to share them! Enjoy with your son! Thanks for the feedback/comment! So glad you likes this post and thanks for sharing it with your group. Wow. I love all this paper play. 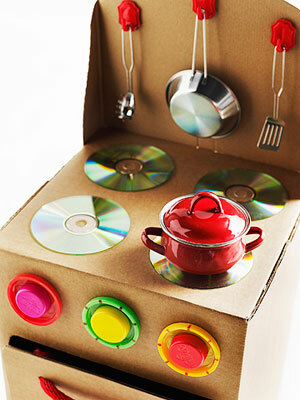 It’s so fun to see how you repurposed other things too like spray bottles and old CD’s. Awesome. And so fun! Genius! Thanks for the Great and thrifty Ideas! We’re adding this to our list of favorites over at http://Dayton.Mom-Spot.com. What a creative post filled with hours of fun for the entire family. The kids can help make the items too! Thanks!!! Glad you like the post! My 2 year old cousin and I are going to have a blast with these!!! I’m so glad I saw this! !